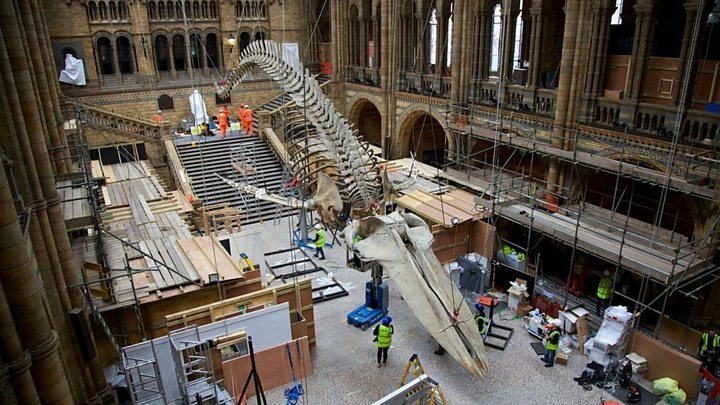 London's Natural History Museum (NHM) has undergone a major revamp with a blue whale skeleton now forming the main exhibit as visitors come through the front door. 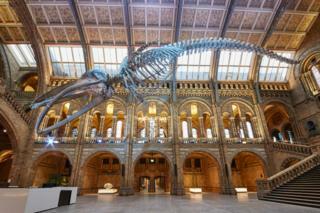 The marine mammal replaces the much-loved Diplodocus dinosaur, "Dippy", which will soon head out on a tour of the UK. The museum believes the change will give its image a refresh. It wants to be known more for its living science than its old fossils. The museum employs hundreds of researchers who engage in active study on a day-to-day basis. Yes, they use the 80 million-odd specimens kept at the South Kensington institution, but their focus is on learning new things that bear down on the modern world. In that sense, the blue whale is regarded as the perfect emblem. The specimen is being given the name "Hope" as a "symbol of humanity's power to shape a sustainable future". Blue whales are now making a recovery following decades of exploitation that nearly drove them out of existence. Staff have spent months preparing the 126-year-old skeleton for its new role. First, it had to be removed from its old hanging space in the mammals gallery. Then it had to be cleaned and in a few places repaired and strengthened. And finally, it had to be re-hung from the iron girders that support the ceiling in the Waterhouse building's spectacular Hintze Hall. The BBC was given exclusive access to the whole process, and a Horizon documentary, narrated by Sir David Attenborough, will go out on BBC Two at 21:00 BST on Thursday. The film will air at about the same time as the NHM's patron, the Duchess of Cambridge, and Sir David, inaugurate the new exhibit at a gala reception. A great many people were involved in the make-over, but the promotion of the whale represents something of a personal triumph for Richard Sabin, the museum's principal curator of mammals. He championed the change and suggested the dynamic lunge-feeding pose that the whale now assumes. It was on a visit to the NHM in 1976, as a boy of 10, that Richard first saw the skeleton in its old display position. He describes that experience as transformative. "I was absolutely blown away," he told BBC News. "I remember running up the stairs to the balcony and asking an attendant if the whale skeletons in the gallery were real. And she said 'yes, and not only that you can still see these animals in the ocean today'. "I got home and the very next day I headed down to the public library to try to find as many books as I could on whales. It was, to coin a phase, a defining moment." For the Horizon film, Richard can be seen tracing the history of the specimen - meeting the descendants of the Irish fisherman who despatched the animal with a makeshift harpoon after it had beached off County Wexford in March 1891. But he also travels to North America, to the Pacific Coast, to join the Cascadia Research Group as they track migrating blue whales. The group, co-founded by John Calambokidis, attaches tags to the giant creatures. Held on by suction cups, these devices record the behaviour of the whales, even capturing 4K video as they dive underwater. The team is learning key facts that will help conserve the majestic animals, which went to the brink of oblivion thanks to 20th Century hunters. 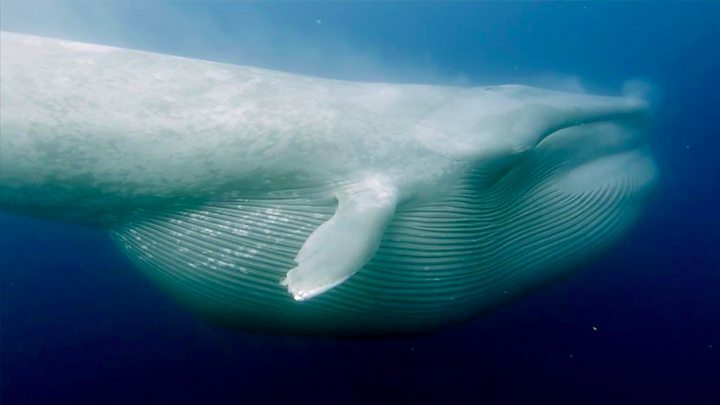 "We've discovered that blue whales spend twice as much time at the surface at night than they do in the day," John told Horizon. "That's the period when they're most vulnerable to ship strikes. That identified right there that we need to be most concerned about ships and their transiting through blue whale areas at night rather than the day." For Richard, the observation of whales in the Pacific confirmed his desire to see the conservation icon put centre-stage at his museum back in London. "It's been an honour and a privilege to work with the specimen that inspired me all those years ago - to breathe new life into it; to inject science from the field into it; to display it in a much more meaningful way. "I honestly believe it will take people's breath away when they see it. "Thursday is going to be an amazing day for everyone involved; I am sure there will be plaudits for what we've done. But I can't wait for Friday morning when the first families, the first schoolchildren, walk through the door and I get to hear what they've got to say about what they see." Fans of Dippy should not despair. After the dinosaur's two-year tour of Britain, it will return to a make-over of its own. The skeleton, which is actually only a plaster cast, will be fashioned again in bronze and placed in the east garden in front of the museum. You can watch a trail for Horizon: Dippy and the Whale. After broadcast on BBC Two, the programme will be available on the iPlayer.